Members of the DavidsonLearns community gathered at the Pines at Davidson on January 22 to recognize Tom Rynne for his role in developing the region’s lifelong learning organization and creating its most popular offering in a broad and varied curriculum, a lecture series in international affairs. The son of Irish immigrants, Tom grew up in NYC, where he became an NYPD homicide detective, with particular skills in research and analysis. Although the sequence of events becomes necessarily murky, along the way, the nation’s highest intelligence community became aware of Tom’s abilities and recruited him to work at the Defense Intelligence Agency. He moved with his family to Northern Virginia and set to work. If asked about his security clearance, “Well. It was high,” Tom shrugs, eyebrows up on “high.” Needing to brief the top brass before dawn, he was on the job by 1:30 a.m. and asleep most nights just after the evening news. During 24 years in the Defense Department, he accumulated extensive knowledge and expertise, and many stories that cannot be told. Fast-forward to retirement: Tom and his wife, Lillian, moved to the Davidson area in 2007 to be near their son and four grandchildren. Once settled, Tom set about to find outlets for his remarkable energy, varied skill set, intellectual curiosity, and friendly disposition. Tom found many volunteer opportunities, and in 2012, he joined a small group of local citizens determined to form a lifelong learning institute to serve the community. That fall, DavidsonLearns announced its inaugural term, offering three courses. Today, the course list includes up to 18 courses each term, developed in response to the region’s growing enthusiasm for adult learning. At the gathering Tuesday night, the organization’s first president, Amy Diamond, described Tom as a mensch: a person of high integrity and honor. 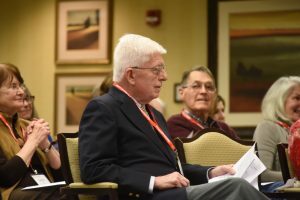 Current president Wynn Mabry read a board resolution decreeing that the course Tom inspired, and nurtures, would now and forever be known as the Rynne Lectures in International Affairs. Tom introduced his family members in attendance, expressed his gratitude for the honor, and proceeded to deflect the credit. “I just had an idea. There are just so many people who helped,” he said, listing name after name. He praised the community he had joined and spoke emotionally about its generous and service-minded residents. A celebratory cake was served while guests thanked and congratulated Tom. Some departed, while others, including the man of the hour, took their seats as the hall became a classroom. 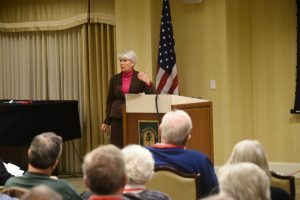 Then Shelley Rigger, senior fellow with Foreign Policy Research Institute’s Asia Program and Davidson College Brown Professor of East Asian Politics, began to deliver the first of the 2019 Rynne Lectures in International Affairs. Learn more about lifelong learning at its website. Whereas, Tom is a modest, courteous, intelligent, true gentleman, who has made vital contributions to the success of DavidsonLearns and its members, with his fascinating wealth of real-world experience in his subject area, his thirst for knowledge, and his kindness. 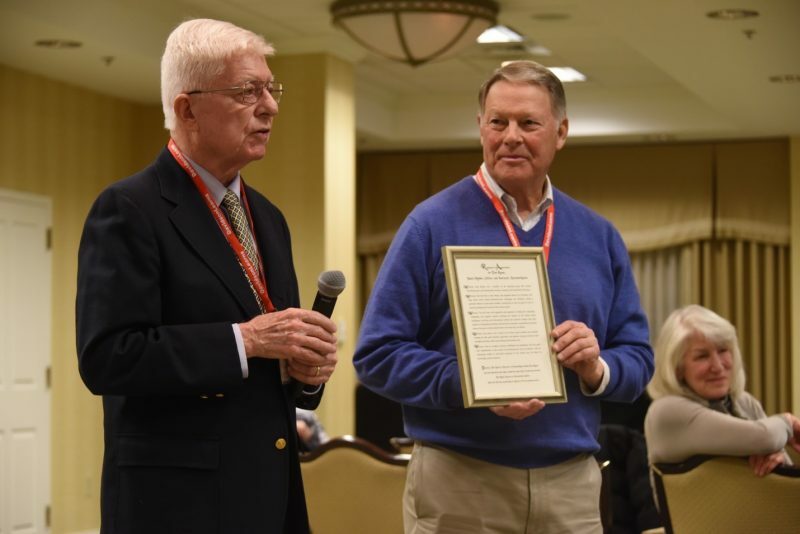 Therefore, the Board of Directors of DavidsonLearns thanks Tom Rynne and with admiration and respect, names the course that he created and nurtured the Rynne Lectures in International Affairs. Done this Twenty-second Day of January 2019 by unanimous action.